Scott Fly Rod president and rod designer Jim Bartschi is 48 years old and has been making fly rods for over 20 of those years – as well as designing them for 22. He started fishing around 7 years old with ultralight spinning rods in high country creeks and lakes for trout, and discovered fly fishing when he was 12. He’s been fly fishing ever since. I recently tested one of Scott’s flagship products – the G2 fly rod. I then asked Barschi a few questions about the G2, and about his company. Here are his answers. RM: Explain your fly rod design philosophy. JB: I look at fly rods as tools that need to perform a complex set of tasks. They’re part of an overall system that when matched up properly can make angler’s experiences more enjoyable and successful. 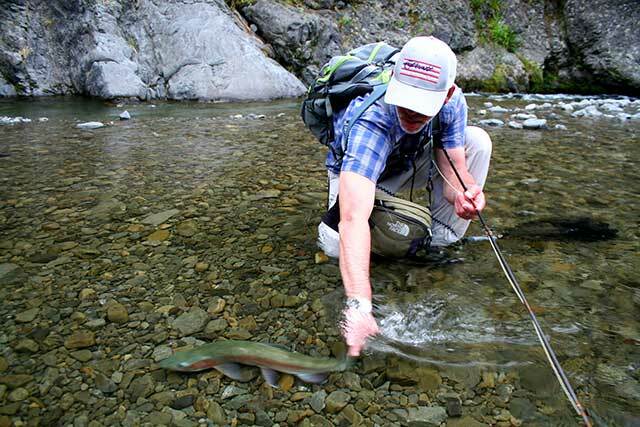 A fly rod needs to do a lot of things to fulfill its role in this system. Once you start drilling down into this idea it gets very complex. Take casting. There’s a huge difference between the requirements for a 3 weight dry fly rod, a rod designed to target musky and pike, a 10-foot 7 weight for summer steelhead and atlantics, or a tarpon rod. Fly sizes, line types, line speeds, loop shapes all come into play. My preference is for rods that are progressive, meaning they bend according to how much line is out of the rod tip and the amount of acceleration and power put in to the rod by the caster. Add in other considerations like mending, line control, fly control, tippet protection, fish fighting characteristics, and the demands of the design project start getting really interesting and fun to work on. What tapers will I design, and which materials will I choose to accomplish the set of tasks required of a specific rod model? I try to never lose sight of the target species, techniques required to successfully catch them, the environment they’re encountered in, and the line that’s going to be used. Another important area of focus is fit and finish. Tools can be beautiful in their construction and appearance. Are we using the best materials we can design and source? Are we using the best techniques to craft the rod? Are we thinking of things that enhance the angler’s experience? Scott has innovated a lot little things we consider angler friendly, like alignment dots at ferrule connections to quickly assemble the rod, measuring wraps to allow a quick judgment of size and promote better catch and release practices, or self-indexing reel seats that make rigging easier. And last, as a company, we choose to focus on one thing: handcrafting fly rods. We could branch out into the lower price point import market, or add fly reels and rain jackets to our line up, but we’d rather put our energy into fly rods. RM: What’s the first item on your check-list when you set out to design a new product? JB: Does it have a tangible reason to exist? For example, does it allow us to fish for a new species, or use a new technique? Does it improve upon techniques we regularly use, or make the angler’s experience better in some way? Without a concrete purpose, there’s no reason to design and release a rod into the market. RM: What are you most happy about regarding the current state of the fly rod industry? JB: I’m most happy with the quality level of rods. The overall quality combined with a wide array of price points means anybody can fish a rod that is functional and enjoyable. That’s good because it opens up the sport to anyone interested. RM: How do you see the entire (rods, reels, lines, wearables… ) industry evolving in the future? JB: In recent history, and the near future, evolution has been, and will be, all about refinement. Applying better materials and construction techniques has really enhanced quality and functionality, from clothing to rods and reels. Breakthrough technologies are rare and can be counted on our fingers: plastic-coated fly lines, breathable fabrics, graphite fly rods—those happen generationally, not every new product season. RM: When you read customer feedback, what are the most common misconceptions anglers have about fly rods? JB: Our customer base is really well informed. I supposed that’s a benefit of working only in the top end of the market and only selling our product through specialty fly shops. We tend to cater to the 10-percenters, at least that’s what I’ve heard them called; you know the ones that catch 90 percent of the fish? They tend to be really passionate about the sport and do a lot of research. RM: How does Scott differentiate itself from other manufacturers? JB: I think our commitment to being a company focused solely on top-performing fly rods, handcrafting them start to finish in our shop, and selling them only through fly shops, sets us apart from our competitors. We’ve been quietly innovating fly rods for 40 years. A lot of the things we introduce first eventually end up in other company’s rods. Whether you agree with the above sentiment or not, one thing becomes clear after handling a G2 fly rod: it’s a tool that is perfectly designed, crafted and suited for its fishing application. I passed the G2 to a fishing friend and said “have fun with it, I’ll be back after a lunch.” When I returned, the comment that most struck me was: “This rod would have felt right to someone fishing 20 years ago, and would feel right to someone fishing it 20 years from now – these guys (Scott) are on it.” It’s a sentiment I agree with, and while the comment may be lacking technically, you cannot deny that tremendous feeling when an implement performs and feels just right. To my mind, the G2 is proof that Scott is so object-oriented that they’re willing alter, reformulate and rethink their craft—their materials, their processes, their technologies—in whichever way necessary to obtain that desired object, and merely stating that G2s are ‘crafted with the utmost care and attention to detail’ (you’ve read that phrase 100 times, at least), doesn’t quite cover it. Every single grip is hand-tapered and matched precisely to the blank it’s fitted to. I discovered that the varnished, coarse top end of the grip is a design reference to a 1972 Scott product—a neat little flourish. Production tolerances are measured in hundredths of an inch and prepreg is (surprisingly) hand cut in small batches rather than machine cut. Rods are also hand-wrapped instead of machine wrapped. As a final, personalized touch, the Scott logo and serial numbers are hand-inscribed. I spent 3 days fishing the G2 and can honestly say that it may be the best presentation rod on the market right now. G2 pricing and specs are available here.